First and foremost, we couldn’t be more grateful to Martha’s Vineyard Community Services for allowing us to take part in their Possible Dreams Auction. With their help, we were able to raise $3,250!! We hope that next year, we can do even more for this great island of ours. Also, as you may or may not have heard, we were mentioned in VOGUE Magazine! The iconic publication recommended travellers take a sunset cruise aboard our Tigress with a direct link to our website. We had no idea that it was coming. What a wonderful surprise! If that isn’t a feather in our cap, we don’t know what is! Speaking of our website—and caps for that matter—our on-line store is finally live! That’s right! It’s been a long time coming, but our team has been working hard so that you can bring Catboat Charters and Martha’s Vineyard home to you! We’ve been overwhelmed by the number of people who reach out to us on a daily basis asking if they can buy our hats or our long sleeved tees over the phone. In high season especially, it’s a lot to manage. That’s a problem for which we couldn’t be more grateful, truly. 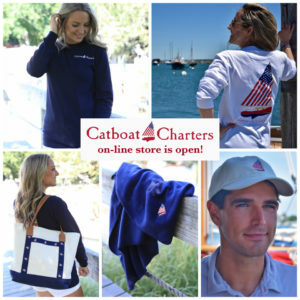 Now, with the website, our guests can order Catboat Charters merchandise for gifts, as reminders of a sail we shared, or to surprise us by showing up for our first sail together in full gear! Catboat Charters Baseball Caps: These pigment-dyed, top quality, cotton caps come in ivory, khaki, and Nantucket Red! Regardless of which color you order, each cap is embroidered with our Catboat logo on the front, MV embroidered on the side, and ‘Catboat Charters’ embroidered on the back. The cap fastens in the back with a beautiful antique brass clasp over a leather strap. This is truly a Martha’s Vineyard classic. Catboat Charters Long Sleeved Tees: Whether you prefer the navy or the white, our Tees are truly a favorite among our guests. They are pre-shrunk, 100% cotton, and come in sizes small through double extra large. ‘Catboat Charters’ is printed subtly across the upper left breast and our sailboat logo is boldly printed on the back. Wherever you wear these comfortable, USA made, tees, you will receive a compliment or two! Catboat Charters Nylon-lined Canvas Tote: This classic tote is the perfect vacation bag! White and navy canvas detailed with our Catboat Charters ribbon and leather handles make this bag the excellent beach companion or for strolling up Main Street Edgartown for a leisurely shop. Whatever your plans, you’ll be glad you brought it along. These made-in-America bags make great gifts too! Catboat Charters Blanket: Although we don’t like to think about it, cool nights are coming! What better way to keep the summer memories alive than by snuggling up under our elegantly understated throw blanket? This anti-pill, American fleece blanket comes in Navy blue with the Catboat Charters sailboat logo embroidered tastefully on the corner. It’s just enough to remind you of your summer sail, your summer walk, and your summer swim…maybe enough to make you look forward to your next Vineyard trip! That’s it! Be sure to check out our store by clicking on ‘shop now’ on our website! Again, thank you everyone for continuing to give us our best season! The weather is still perfect and the days still long. We can’t wait to have you back out on the water with us! FANTASTIC ! Continued success Catboat Charters ! !